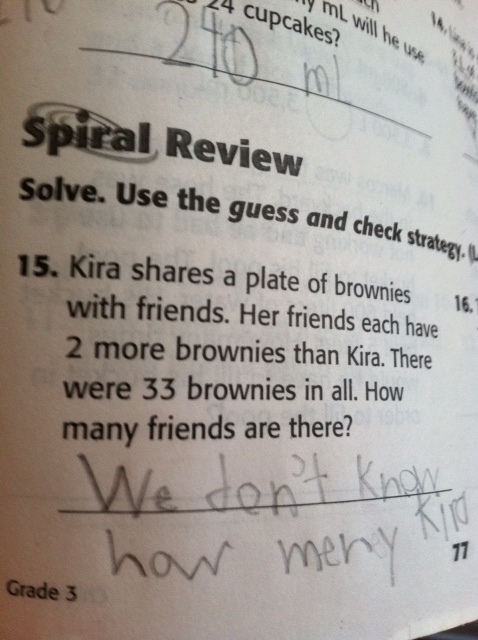 Kira shares a plate of brownies with friends. Her friends each have 2 more brownies than Kira. There were 33 brownies in all. How many friends are there? Hmmm. Neither my husband nor I could figure this out. I even ran it by some friends who were baffled too. Don’t we need another clue in there? I hereby challenge all Math Nerds out there in Blogtropolis! I know you’re there (Hi Cousin Denise! Aunt Patty! Clare! David of Sounds Like Orange, I see you!). Are you smarter than a third grader? Apparently I am not. We went with: “We don’t know how meny Kira has,” as our answer. (I thought the misspelling of “many” made it look more legit- like JC did the homework all by himself). I’m not sure if the following makes a difference: The directions say, “Solve. Use the guess and check strategy.” I don’t know what that strategy is or how it could help, but maybe you math teachers are in on the secret. Also, JC came home declaring the answer “6,” but I still can’t figure it out. That “6” answer may have just been playground gossip. Or maybe the number of pretzels he ate off the floor, or the number of kids playing “piggy patrol” during recess. Who knows? He’s nine. But maybe it’s the right answer. I dunno. If you want to give it a shot, good luck! Let me know if you figure it out. 6? Kira has 3 and her 6 friends have 5 each. FYI, that’s algebra that I didn’t get ’til much later. Your kid is in the smarty class! I knew you’d figure it out! Dana wears the patient pants and you wear the smarty pants. MotherJam came up with an alternate answer too. Dana also makes sure I replace the smart pants when I get holes in them. MotherJam wins, though, for creative problem solving! 4 friends. They each had 7 brownies (28 in total). Kira had 5. 5 plus 28 equals 33. This took me about 3 hours and 33 brownies to figure out. Genius! Pure Genius! I must say I was shocked they used brownies in the example and not rice cakes or apple slices. I bet they couldn’t get away with that in public school haha. oh wait. was I eating pot brownies? Or is there more than one answer? So we add 3 to balance it out. As a test, let’s plug this back in. Haha! Thanks! Congrats on being as smart as a third grader! I aspire to reach your level someday!! LOL! Kira…tsk tsk. She should transfer to tracycembor school of LIFE! Ok – I would agree with JC and say 6 friends! If the friends have five each – then six times five is thirty. That leaves three left for Kira (which is two less than her friends.). I used guess and check because I knew that Kira would have two less than the friends and I just played with numbers until it worked out. Not very scientific but my guess is they are working on number sense! You were always the smartest one of us! Thanks, and you will be getting more emails from me as the homework gets harder! There are MANY nights my husband and I are baffled with our daughter’s 4th grade homework…. Sad isn’t it? Us too. I am not smarter than a third grader 😦 But I am sure this has to be a Mensa test. 🙂 I am back in second grade with you. Don’t feel bad. That’s too many brownies anyway. I just want to say that Kira’s friends are pigs and they should have stopped at one brownie each. Absolutely! NO WAY a teacher can mark that answer wrong! That would depend on how much hash was in the brownies. More hash, more friends. Hi Jess, I can see why your mind is so logic. I have non of these questions or something to add, sorry; but you have a great blog. God bless and have a stunning day.